While CT is an important clinical tool, researchers and manufacturers continually are pursuing new innovations to access more diagnostic information and improve patient care. With these goals in mind, spectral CT is experiencing a comeback since it was first studied in the 1980s with single-slice scanners. Because of various hurdles, it never made it into clinical practice, says Stefan Ulzheimer, PhD, director of global scientific marketing for CT at Siemens Healthcare. In 2005, Siemens was among the manufacturers to reintroduce spectral CT on modern multislice CT scanners. According to Ulzheimer, spectral CT, which he sometimes refers to as dual-energy CT, is best observed with airport CT scanners, which implement this technology for security screening. “You find it at the airport with all the luggage scanners to see if something contains water, for example, or metal,” he says. These scanners are sensitized to certain materials, revealing different properties of the luggage’s contents and helping identify potentially dangerous items. Just as in airport scanners, spectral CT in a clinical setting can unlock information about materials or tissue that are composed of multiple properties, which may not be fully realized through traditional CT techniques that use a single kilovolts peak (kVp) setting for the X-ray tube. Spectral CT acquires CT datasets at both low- and high-kVp settings. This can improve diagnostic information because it helps clinicians discriminate between some materials, which image differently at low and high energy. For example, calcium at a certain density may look the same as iodine of a certain concentration when imaged at one energy level but appear different at another level. “The idea behind dual-energy CT or spectral CT is that different materials or the attenuation of different materials behaves differently when you look at different energies,” Ulzheimer explains. Acknowledging the usefulness of scanners utilizing different energy levels, imaging manufacturers have begun developing spectral CT advancements for their CT offerings. They also are exploring specific clinical applications for spectral CT. The most straightforward technique in obtaining spectral CT information is the single-source sequential scan, which requires two scans, one at a low-kVp setting and the other at a high-kVp setting. This method employs the conventional scanner and doesn’t require extra hardware other than supplemental spectral applications. However, it presents significant time lag between the two scans, which may affect the final image, especially one of tissue in motion. Therefore, manufacturers have been exploring faster techniques and improved equipment to decrease time lag and save patients from the longer waiting periods for the second scan. GE Healthcare is working on the fourth generation of its gemstone spectral imaging (GSI) dual-energy scan mode. “Images at high and low kVp are simultaneously acquired using kVp switching as fast as 0.25 msec. The dual scans are reconstructed into spectral CT image data using projection and raw data, utilizing physical attenuation characteristics of known materials like iodine and water, etc,” says Saad Sirohey, PhD, manager of global molecular imaging CT clinical applications for GE. GE also is developing Revolution CT, which is equipped with the GSI technology, although that system is still awaiting FDA clearance. Siemens has two single-source, dual-energy CT systems currently in its lineup: SOMATOM Definition AS and SOMATOM Definition Edge. These systems acquire spectral CT data by conducting two consecutive scans at different energy levels. Siemens also has produced dual-source CT systems equipped with two X-ray tubes and two detectors that can acquire images at two energy levels. Currently available in the SOMATOM Definition Flash, these systems scan simultaneously at both low and high energy levels with a selective photon shield blocking the unnecessary parts of the energy spectrum, thereby reducing radiation exposure. Siemens has another dual-source CT system, SOMATOM Force, a work in progress that debuted at RSNA 2013 and is pending FDA clearance. While some companies use the terms “spectral CT” and “dual-energy CT” interchangeably, Philips Healthcare provides a distinction between them. Philips’ new IQon Spectral CT, which also made its debut at RSNA 2013, is based on the company’s NanoPanel Prism design. Although the IQon system does access diagnostic information from different energy levels, it uses a spectral detector, which detects X-ray photons of both energies simultaneously. With this technology, Philips claims physicians won’t need to determine what clinical information is needed at the time of the scan because the IQon system obtains all of it and can be accessed at any time. The company likens this technology to a prism, which can split a beam of white light into the colors of the rainbow. “Traditionally, CT provides anatomical information in black and white or many shades of grey. With the IQon Spectral CT, we now add color to quantify and characterize tissue based on its material content,” Olszewski says. While the IQon detector currently is pending FDA clearance, there are investigational systems in place at Hadassah Medical Center in Jerusalem, Israel, and at University Hospitals Case Medical Center in Cleveland. CT systems with the NanoPanel Prism design are available for sale within the United States. Ulzheimer also says spectral CT can eliminate noncontrast scans in examinations involving the liver and for the detection of kidney stones. “You have the ability to remove the contrast agent after the scan based on the dual-energy data that you acquire. You can actually skip the noncontrast scan and only do the contrast-enhanced scan after the acquisitions virtually remove the iodine from the image,” he explains. By eliminating the need for a noncontrast exam, technologists can free up their time and resources to focus on better patient care. “The true importance in this technique is the impact this can have on the care being delivered to the patient without any sacrifice to the data needed to make a confident diagnosis,” Olszewski says. An image’s clarity impacts physicians’ diagnosis as well as their assessment of the best proper treatment for their patients. By discriminating between tissue or material composition, spectral CT may aid physicians in this process, especially when artifacts obstruct the image. For example, conventional CT techniques frequently are challenged by implanted metal hardware, such as a hip or knee prosthesis, and beam-hardening artifacts, which generate streaks or dark banding on an image and may reduce its quality. 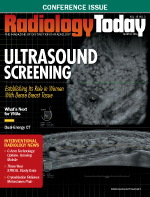 “On the one hand, conventional CT is a ubiquitous diagnostic tool for the physicians, but on the other hand, it does have challenges,” Sirohey says. “A polychromatic beam is a major cause of beam-hardening artifacts and may result in indeterminate small lesions reducing a physician’s confidence in diagnosis. Spectral CT provides tools for the physicians to overcome these challenges and make CT a more specific diagnostic tool.” Because certain energy levels are more sensitive to artifacts than others, combining the images from two different energy levels helps radiologists eliminate them to better assess the diagnostic information. Ulzheimer says there is strong evidence in the literature suggesting that spectral CT also may determine kidney stone composition, which can be a significant factor in the physician’s call on best treatment. “For example, uric acid stones can be treated with drugs or therapy, whereas the calcium stones need to be destroyed mechanically. This is not information that you can get easily with any other method,” he explains. According to Sirohey, spectral CT’s use in other potential clinical applications has been demonstrated in further studies, including “optimization of contrast for vascular workup as well as cardiac imaging for enhanced coronary visualization.” Spectral CT may increase sensitivity to contrast, which maintains image quality while reducing the amount of contrast given to the patient. This technology also separates calcified plaque from iodine, which may improve plaque assessment, another important tool in treatment decision making. Sirohey also points to an article published in February in Abdominal Imaging suggesting that radiologists can use spectral CT to aid in lesion characterization, especially in the abdomen. Indeterminate lesions are most common in the abdominal region, and additional testing is sometimes required to accurately interpret them. By separating materials, spectral CT provides access to better diagnostic information to help physicians characterize those lesions and improve their confidence in diagnosis. Spectral CT is a significant step forward in CT technology, Sirohey and Olszewski say. While Ulzheimer cautions that “it takes a long time to get things into clinical practice in certain areas,” the volume of publications and studies surrounding spectral CT suggests that it has the potential to bring a new level of preciseness to CT imaging. More diagnostic information means physicians will have greater confidence in determining diagnosis and treatment, which can lead to better care being delivered to the patient—an important value in the current health care reform environment. — Leesha Lentz is an editorial assistant at Radiology Today.